Do you design to dye or dye to design? Do you choose your fabric after you've decided on your design or do you dye to design? Elizabeth Barton's technique of Dyeing To Design is the latter approach and here is an excerpt taken from the beginning of her online workshop. Wow, I learned something in the first few paragraphs, there's no telling how much more I can learn by enrolling in her workshop! Broderie Perse quilts are so elegant and beautiful. Broderie Perse is an applique technique that has been around for centuries.... have you ever wondered how to make one? You will be surprised how easy and fun these quilts are to make. Would you like to learn too? I don't know about you, but I've always enjoyed hand applique. It's easy to learn, fun and most of all relaxing. We all need a little of that in our busy lives! Cool Colors, Warm Colors or Mixed? What's your preference? Cool colors, warm colors or a mix of colors? Check out these three quilts all made from the same pattern - a Jennifer Houlden design. Marjorie is Leaving the Fibre World? 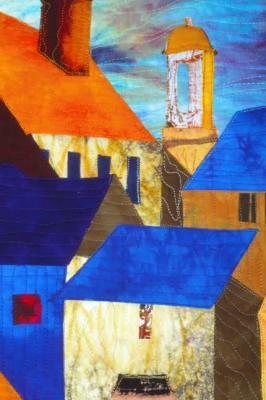 After 47 years as a fiber artist and 18 years on the internet with Fabric Designs.com, Marjorie is retiring! She is keeping a few of her larger customers who must have her signature fabric for their businesses in quilting and the fiber arts but all other dyeing activity will be sidelined. Are You Stuck for Quilt Design Ideas? If you are stuck on getting inspired in quilting, you definitely want to follow through with this online workshop as you'll end up with many design possibilities in as short as a week! Here is an excerpt taken directly from Elizabeth Barton's class Inspired to Design. We all need to de-stress a little... or a lot! In today's world, we always look for ways to de-stress. I couldn't think of a better way to do that than with Nancy Chong's Stress-Free Celtic Knot table runner. I don't often have time to take classes online, but this class is one I made sure I did... mainly just to unwind a little but also to create a wonderful gift for my mother who now enjoys the table runner I made in class. Would you have ever thought of this? We all know, it is never too early to start thinking of Christmas, really? Realistically, we always think about all the things we want to do in preparation for this joyful time of the year way too late and always run out of time - well that's what happens to me anyway. So usually once we hit June, I start thinking about my Christmas projects and offering my Christmas workshops for those who want to prepare early. 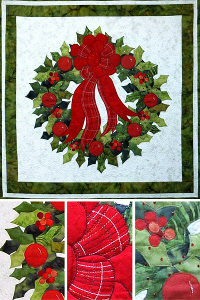 One of my favorites is my Christmas Holly Wreath, which is a pattern as well as an online workshop.